Ethiopian Airlines Flight 302 was a scheduled international passenger flight from Addis Ababa Bole International Airport in Ethiopia (at 08:38 local time, 05:38 UTC) to Jomo Kenyatta International Airport in Nairobi, Kenya. On 10 March 2019, the Boeing 737 MAX 8 aircraft which operated the flight crashed near the town of Bishoftu six minutes after takeoff, killing all 157 people aboard (149 passengers and 8 crew on board). The cause of the accident is under investigation. The Boeing 737 MAX 8 model first flew on 29 January 2016 and entered service in 2017, making it one of the newest aircraft in Boeing’s commercial airliner offerings, and the newest generation of Boeing 737. As of February 2019, 376 aircraft of this model have been produced, and one other has crashed, Lion Air Flight 610 in Indonesia in October 2018. 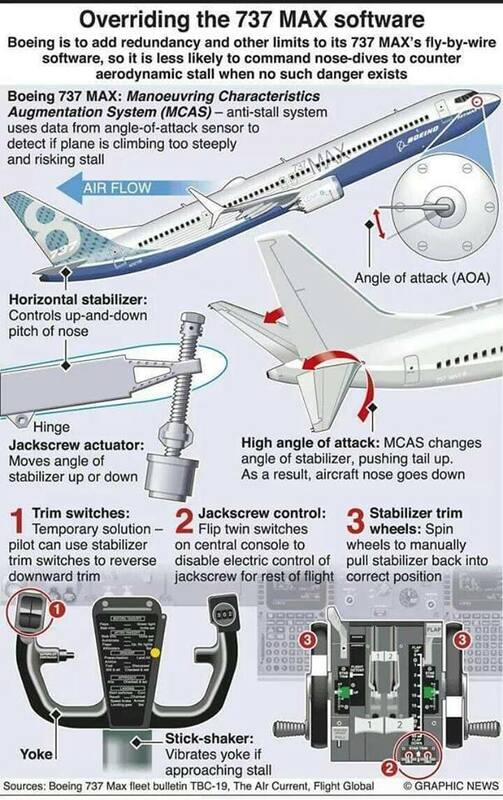 Following the accident, the Boeing 737 MAX series of aircraft was grounded by various airlines and government regulators worldwide. One minute into the flight (08:39), the pilot reported a “flight control” problem but decided to continue the flight; three minutes into the flight the aircraft accelerated beyond its safety limits, and the pilot requested permission to return to Addis Ababa while the air traffic controllers had already been diverting other approaching flights. However, the aircraft then disappeared from radar screens and crashed at 08:44, six minutes after takeoff, having reached an altitude of about 9,000 feet MSL. Flight tracking data showed that the aircraft’s altitude and rate of climb and descent were fluctuating. Several witnesses stated the plane trailed “white smoke” and made strange noises before crashing. It crashed near the town of Bishoftu, 62 kilometres (39 mi) southeast of Bole International Airport. Photographs of the accident site show a large crater with only small pieces of wreckage. There were no survivors. Both crashes are currently under investigation, and there is no final word on what caused either tragedy. But investigators are focused on a specific tech feature that may have forced both planes into a nosedive seconds before the crashes. A preliminary report from Indonesian investigators indicates that Lion Air 610 crashed because a faulty sensor erroneously reported that the airplane was stalling. The false report triggered an automated system known as the Maneuvering Characteristics Augmentation System, or MCAS. This system tried to point the aircraft’s nose down so that it could gain enough speed to fly safely. MCAS takes readings from two sensors that determine how much the plane’s nose is pointing up or down relative to oncoming airflow. When MCAS detects that the plane is pointing up at a dangerous angle, it can automatically push down the nose of the plane in an effort to prevent the plane from stalling. Investigators have found strong similarities in the angle of attack data from both flights. A piece of a stabilizer in the wreckage of the Ethiopian jet with the trim set in an unusual position was similar to that of the Lion Air plane, Reuters reports. Boeing says the decision to include this change to the flight control operations wasn’t arbitrary. When the company designed the Max jets, it made the engines larger to increase fuel efficiency, and positioned them slightly forward and higher up on the plane’s wings. These tweaks changed how the jet handled in certain situations. The relocated engines caused the jet’s nose to pitch skyward. 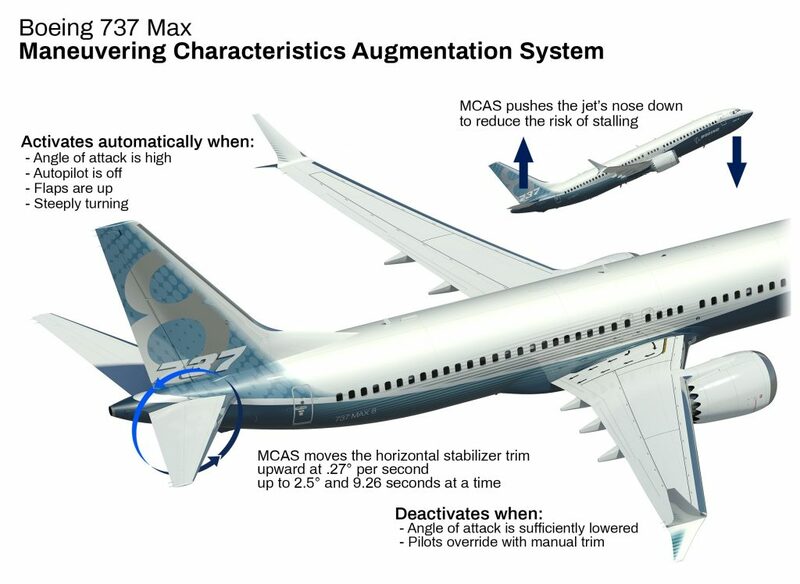 To compensate, Boeing added a computerized system called MCAS to prevent the plane’s nose from getting too high and causing a stall. MCAS is unique to the Max jets, and isn’t present in other Boeing 737s. MCAS is activated without the pilot’s input, which has led to some frustration among pilots of the 737 Max jet. At least half a dozen pilots have reported being caught off guard by sudden descents in the aircraft, according to the Dallas News. One pilot said it was “unconscionable that a manufacturer, the FAA, and the airlines would have pilots flying an airplane without adequately training, or even providing available resources and sufficient documentation to understand the highly complex systems that differentiate this aircraft from prior models,” according to an incident report filed with a NASA database. For Boeing and other aircraft manufacturers, the practice of charging to upgrade a standard plane can be lucrative. Top airlines around the world must pay handsomely to have the jets they order fitted with customized add-ons. Sometimes these optional features involve aesthetics or comfort, like premium seating, fancy lighting or extra bathrooms. But other features involve communication, navigation or safety systems, and are more fundamental to the plane’s operations. Boeing is to add redundancy and other limits to its 737 MAX’s fly-by-wire software, so it is less likely to command nose-dives to counter aerodynamic stall when no such danger exists. The crashes of two Boeing 737 Max jetliners over the past five months in Ethiopia and Indonesia, killing almost 350 people in all, have resulted in the grounding of more than 300 Boeing 737 MAX 8 and MAX 9 passenger jets around the world. Bulletin TBC-19 advises that in the event of erroneous AOA data the pilot should use the stabilizer trim switches on the outside of the yoke to temporary reverse the MCAS nose down movement. The next step, according to the Boeing bulletin, would be to reach across to the central console and flip a pair of stabilizer trim cutout switches to off. These switches would disable electric control of the jackscrew motor that moves the stabilizers up and down. The final step is to spin two trim wheels, found on either side of the central console, to manually control the stabilizers for the remainder of the flight. This entry was posted in News and tagged 302, 737, 8, Airlines, Boeing, Ethiopian, Indonesia, Investigation, Lion, Max. Bookmark the permalink.